We often hear the adagio. In an age when the forms of communication have multiplied we tend to communicate less and feel more alone. We live in an age when you may be asked to work with someone based in a far off country. The company you work for says he is a member of your team. You are supposed to have the literacy for that. We live in an age when people share their thoughts just for the love of blog and patiently build connections that light up their brains, create meaningful dialogues and, perhaps, valuable friendships. We live in an age when a person could be forever grateful to a family who in the middle of the deepest pain decided to donate an organ. We should be ready to accept that some of the people who will mean so much in our lives are always going to be far from reach. We might never share a cup of coffee at the same table. The saddest part, though, is not to accept this reality and limit our most meaningful experiences only to those who we can meet and share in f2f communication. Some considerations on a missing link. One of my favourite novels ever is The French Lieutenant's Woman by John Fowles. I just fell for the way it is written, the links between past and present all seasoned with beautiful use of language by a writer with a wide culture who can relate Victorian dresses to Egyptian horror vacui if he needs to make a point. I was so moved by the novel that I secretely began to dream that one day, some day, I would visit Lyme Regis to see the sights where the movie was shot. Many years later my dream came true. I took an early morning train from London to Exeter St. Davis and a bus to Lyme. I remember the bus driver greeted everyone by their first name. He said to me, "Hello, dear". I felt at home. I spent six hours travelling from and back to London and only two hours in Lyme. I could speak about those two hours for ages. I have never, ever forgotten it. Being in a place I had read and re-read about for years while I was much younger and then being there -I was in my late 20s- was as if past and present borders had become blur, but not with the effect of confusion at not being able to tell one from the other. It was the blending of my present and past into something new that resisted the language prison for lack of a name or another experience to compare. I took photographs with my father's camera. I asked a stranger to take one of me on the Cobb looking just as Meryl Streep on the movie. I spent 20 minutes of my short visit silently sitting on th edge of that old Cobb looking into the sea. I thought about how small whatever problems or challenges I had back in Argentina seemed. I convinced myself it was so. They were far. Far away. 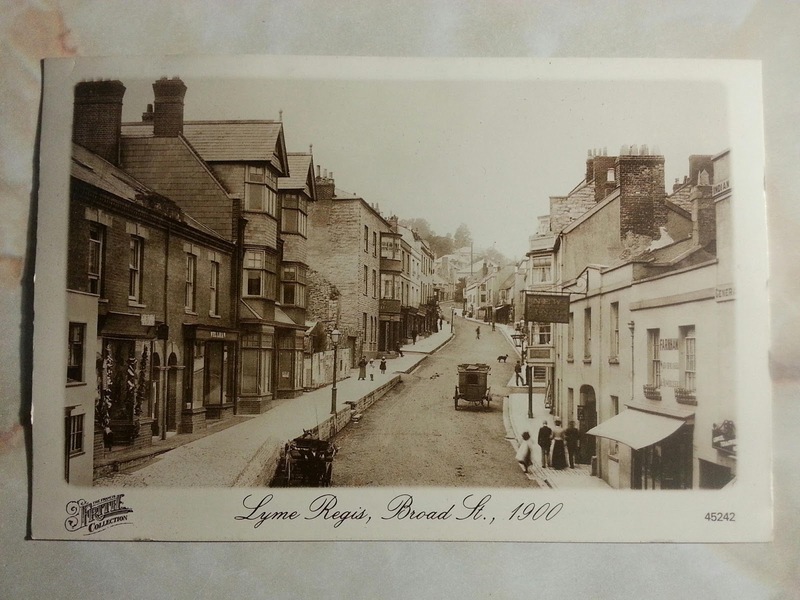 The main street in Lyme seemed taken from a childhood story book illustration. I stood at the door of a fossil shop and noticed some postcards on a metal holder at the door. I took one sepia photo which had been taken from the same spot I was standing at. It was marked Broad St., 1900. I held it up against the real street to confirm my suspicion. Yes, there was hardly any architectural difference between the sepia copy in my hands and the real, present street behind. I noticed a traffic light that broke the spell. I decided I would not take a new photo. I couldn't take a shot more faithful to the reality of me there and then in front of that sight. I bought the postcard. One of my best friends back in Buenos Aires, after hearing me pouring all the details of the trip and my sensations, said that I had found out there in Lyme something that had always been inside. That made sense to me at the time, for most of my feelings in London were not just about the surprise of my first visit, but the confirmation of something I had always known. It felt more like coming back there. This blogging journey -with interruptions and all- has been like reading a novel I like so much that it leaves me with a willingness to travel. Only this time I know that if Idid travel, the differences between the real world I could see there and the novel I've been reading and writing here will not be that many. I should not be so surprised to confirm that what I read is real. In that book, John Fowles makes a kind of experiment pretending he is writing a novel that he, as a writer, cannot predict the ending. He is discovering it all along. Far from an omniscient narrator decreeing what should happen, he is respecting the integrity of the characters of his imagination and following what they ask him to write about them. "But this is preposterous? A character is either 'real' or 'imaginary'? If you think that Hypocrite lecteur, I can only smile. You do not even think of your own past as quite real; you dress it up, you gild it or blacken it, censor it, tinker with it...fictionalize it, in a word, and put it away on a shelf -your book, your romanced autobiography. We are all in flight from the real reality. That is a basic definition of Homo sapiens." I believe that most of my edublogger friends around the world have started writing because they needed to create a spot of their own where they could be more themselves than in a real staffroom -staffroom where, for the most part, they have been seen as revolutionaries, idealists or, at best, edtech pioneers. I think I can sense a touch of loneliness in the voices from the trenches that reach out in blogs and voraciously read others in order to find echoes of themselves buried and resurrecting in someone else's penned thoughts. When you read that which you wish you had written yourself, then a potential connection is made. It begins with resonance in lieu of a shake of hands. The difference between meeting someone for the first time face-to-face or online is that the shake of hands is voluntary; resonance is not. When offline-only people wonder why anyone would spend so much time and emotion growing a blog and responding to comments, they simply miss the point. There is no why, there is no purpose. Yeah, I hear you. Of course there is, but not in the a priori sense of creating a purpose. Not in the fashion of first I know what I want and then I go find it. If I do, success. If I don't I lost my time. Nope. It is a la John Fowles: you need to respect the integrity of the characters you meet, relate to what attracts you from them and find something that moves a muscle in your mind. Let that otherness play hopscotch with you jumping from the blog, across the tweet to you tube. Once you find these friends, they may continue writing about your favourite topics in common. They might just as well change interests. They may go silent and only post photos. They may share about their offline lives or not. They may live close to you or far, far away. They may disappear altogether. None of that is under your control. We do not know the ending. We cannot tell if the main characters will finally reunite. Pure resonance. There's the missing link. And then? I do not know. I cannot tell you because I am too involved in the experience. I have -long ago- been drawn into a powerful game that never really stops. It's gone way beyond the blog. Way beyond how frequently I show up at the usual online spots. At this point, I wonder to what extent the words, the expressions Iam using here in this post are coming from me. There are far too many butterflies in my mind to tell the attribution of the words of others yuxtaposed with my own. The idea of "growing a blog" comes from Konrad (@teachandlearn). No doubt. The image of the "voice from the trenches" -David Truss(@datruss). That's how he described me the first time he linked to my blog. The "butterflies in my mind". That's from Alan's (@cogdog) beautiful, vibrant post. The "say more" is an echo of the many tweets from Bud (@budtheteacher) when he wants me to expand an idea. I think I have internalised at what points of my talking he would like me to explain what I mean. You see, my friends are sometimes more myself than I am. I struggle to express it better. I feel a frustration when I consider that only those who are already part of this reality can make sense of it while many more will frown at this rant (if they get this far). As a foreign language teacher, I wish I could teach you about it. Yet, I have always been and will be endlessly trying to overcome a barrier of expression. And every time my voice resonates in someone's head and they let me know, I feel miracles exist and I am deeply satisfied. All I can teach you is the truth of my experience: I would not try to find anything too specific when reading and relating to people online. I go for resonance. If our natural frequencies are dissonant, I simply stop reading until it evokes a genuine connection again. No worries about reading you on and off or whether you read me at all. If there was resonance once, I know it will bring us together again. For real.